The Dog has been a trifle indisposed for the last couple of weeks. She had started limping and a thorough examination of her pads revealed nothing untoward, nor did she object to having her joints prodded and twisted. Nonplussed, we made an appointment with the ‘Dogtor.’ He agreed with us – she was quite definitely limping, but didn’t seem to have any tender or delicate parts. He sent her home with some ibuprofen and said to come back in two weeks or so, if she didn’t improve. Well, two weeks passed and she didn’t seem to be that much better, so we steeled ourselves for another vet visit. That was yesterday. Today she is better. Animals are strange creatures, are they not? While she has been limping we have confined our daily exercise to a short amble up the road and back, I’ve put on weight and I’ll bet she has too. Today, with no sign of the limp and a spring in her step, I thought we would venture a little farther afield. So we pottered up to the railway crossing and, as that seemed to go all right, we went on a little bit more. Here, to put the good news into context, I had better add that I have just been through a bout of gout, so The Dog hasn’t been the only one who was content to limp locally. Just past the level crossing, we came across this peering at us over the top of the knee-high, roadside grasses. 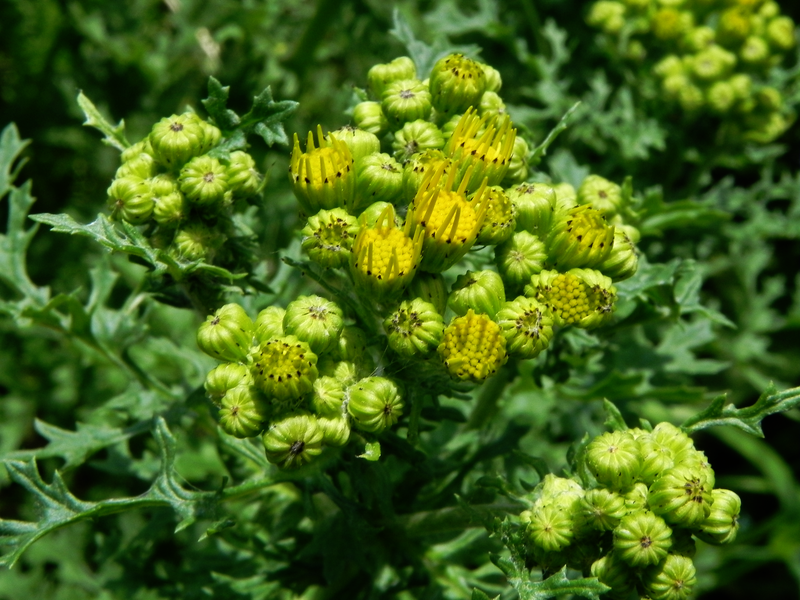 It’s Tansy (also known as Buttons) and yes, you’ve guessed it – it’s good for gout.